When developing bots for public chatting platforms like Microsoft Teams, Facebook, Slack etc. it is very that often not all features are available and therefore can’t be tested using Microsoft Bot Framework Emulator. Public chatting platforms need public endpoints which removes ability for developers to debug applications which extends development process greatly. A solution to this problem is a Software as a Service solution called ngrok. Ngrok is secure introspectable tunnel service to localhost webhook development tool and debugging tool. Service provides public DNS for applications to use and tunnels all the messages to the developer local machine. This way developer can still use public platforms to develop and test and still retain ability to debug entire solution live. In order to develop effectively a developer should be able to create bots locally and publish them easily to the web. 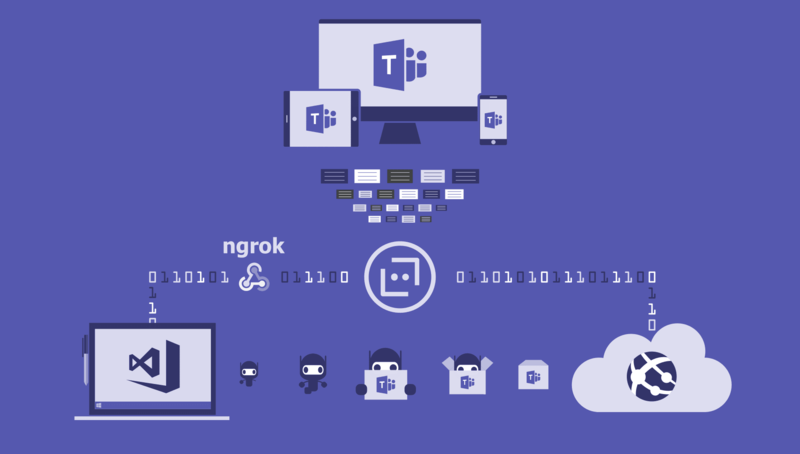 In this article a Microsoft Teams bot example will be presented. Microsoft Teams is a great example of bot channel which does allow for development of extra features and as such making bot framework emulator useless in terms of proper development. Run ngrok using command line. Use the proper port number that will be set up on your local machine. This basically means that bot app will be available under https://89a332c9.ngrok.io endpoint. With free pricing tier developers get random subdomain on ngrok service every time they run the application. This is very troublesome for longer development because during bot registration developer must supply publicly visible endpoint. This means every time developer restarts ngrok they will need to edit bot endpoint on bot framework portal. For commercial uses it is very recommended to purchase license so that developer can register custom domains using command below which will allow for static bot routing under https://marczakio-dev-local.ngrok.io endpoint. Register a bot by using this https://dev.botframework.com/bots/new. Note this is crucial to use this link as the button on the site no Longer points to form creation. Instead it redirects user to Azure Bot Service creation form. Display name name for the bot, this is only display name in the Bot Framework Portal for developers to recognize their bots by name. This does not affect bot functionality in any way. Bot handle reference to bot, does not matter in this example. Long description bot description. Does not affect functionality. Microsoft App ID unique identifier for application registered from Microsoft App portal. Click on the create Microsoft App button to register the app or provide already existing app id. Do NOT share same ID across multiple bot instances. And by clicking Generate password new password will be generated. Copy password as it won’t be shown anywhere later on. Application insights section. Leave this empty for localhost development. In case of bot service Azure fill this for developer during bot creation process. Owners list of accounts which have administrative access to the bot. "full": "Local MarczakIO Teams Bot"
Follow the same process and publish bot to Azure. While the Azure UI changed a bit, it is still very easy to follow Introduction to chatbots post. With that setup everyone can deliver DevOps for bots effectively.